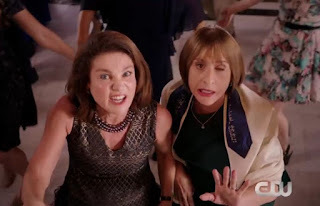 Jewish Humor Central: Tovah Feldshuh and Patti LuPone Sing "Remember That We Suffered" on "Crazy Ex-Girlfriend"
Tovah Feldshuh and Patti LuPone Sing "Remember That We Suffered" on "Crazy Ex-Girlfriend"
The CW Network's video hit sitcom series Crazy Ex-Girlfriend is now in its third season. Back in 2015 we posted a song from the series with actress Tovah Feldshuh rushed into her daughter's home singing Where's the Bathroom? Last year the second season included a funny spoof song with Patti LuPone playing the role of Rabbi Shari at a family Bar Mitzvah. LuPone and Feldshuh join the family celebrants in a hora "Remember That We Suffered". Broadway legend Patti LuPone guests as Rabbi Shari and sings “in a minor key to remember that we suffered.” That would have been enough —dayenu! — but then Tovah Feldshuh, in a recurring guest role as Rebecca’s mother Naomi, joins in, too. If there’s not an online petition yet to replace “Hava Nagila” with this song during the hora at all future bar mitzvahs, there should be. Agreed. Relieves those Sunday morning hangovers. Love this show. But it is on The CW network, not Amazon Prime. But what is on Amazon Prime is the even better show The Marvelous Mrs. Maisel. Thanks for the correction. I updated the post. The Marvelous Mrs. Maisel is great. I'll post about it and its Golden Globes win on Tuesday. Offensive and demeaning to Holocaust survivors. I have a sense of humor but this is not funny. agree with you all the way. Horrible song. I live in Israel, We just buried a rav, father of 6 who was murdered on the main road near his home in Chavat Gilad. I am a 2G - both parents survived the Holocaust, and find this "American" humor offensive. Glad I have no idea what this TV program is all about.